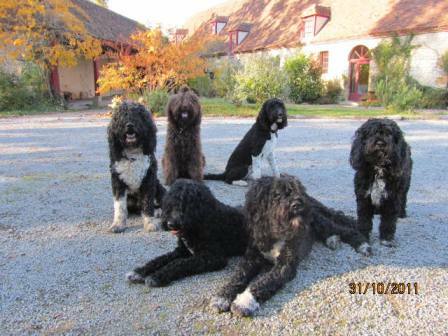 Interesting conversation I had yesterday with an Irish Water Spaniel breeder about prices for a working dog in France. I have also had this conversation with a friend in the UK who works her Barbet for real and not for show, who also could not believe what was going on in the Barbet world....No hunter will ever pay the high price asked for by some because he can get a 7th group Griffon for much less and rest assured of his natural working ability, lineage/pedigree and not have to worry about his coat care. ...and what is it? 2500 € for a labradoodle? Is that what the Barbet is up against?My gawd. A dog with no lineage, not any working ability and no selection grid at the SCC because it's not a recognized breed with an FCI standard?Hum.So never mind the champion titles....where in certain countries you just go to the show and get points because there is no competition???Hum. 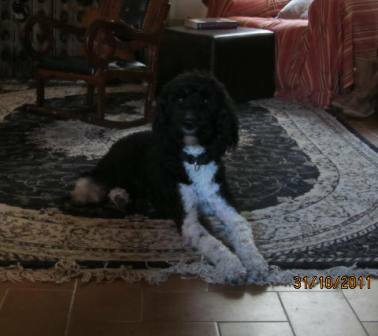 After having adopted Vera de la perte aux loups in 2007, from a couple in the Netherlands who said she was not "the dog for them", I decided that she was ready for the "big world" and to move on. She was rehomed (again)very carefully with a 3-week trial period with a lovely young couple who live in the country and only have 1 animal, Vera to take care of. Some of you may remember this at the beginning of the year. Vera needed to have her own humans and not share me with other dogs, because she was too exclusive. She has settled marvelously well and I enjoy stopping in for a cup of tea to see her, them. She is now a poised lady, much calmer than before and even if she is no longer mine, she always will be...my Vera girl. She ran all over the domaine with all her friends, minus Thelma who is spending the weekend with her niece, Corisande. Une remarque intéressante : Grégoire Leroy a prélevé l'ADN d'un grand nombre de barbets et justement ceux dont je parle et il nous a dit cet été au Blanc, qu'il avait été surpris par la très bonne diversité génétique, ce qui n'était pas prévisible à la lecture des pedigrees. Pour ce qui concerne la retrempe avec des caniches, cela ne pouvait le surprendre puisque ces caniches apparaissent sur les pedigrees, par contre oui, les autres races de chiens utilisés l'ont surpris et ce n'est pas pour rien qu'il a aussi prélevé des chiens d'eau espagnols et portugais au Blanc. Donc si un jour on doit faire éclaircir la situation par un véritable diplômé patenté, celui-là n'est pas le plus mal placé. G Leroy who has written several papers about the Barbet and who was in Le Blanc in 2007 to get blood samples for his studies, was surprised at the very good genetic diversity in the Barbet. Concerning the crossing with Pooldes, it was of no surprise to him as they appear in the pedigrees.The other breeds did surprise him and that is the reason he drew blood on SWD and PWD. So, one day...when we need to sort things out, he would be a good person to ask for help. Genetic diversituy is always a good reason to do something, but did we really need it when it is said everywhere we have "plenty"!Hum. ( PS: I am sorting through the thousands of documenst I have from my computer crash last summer. Some good to re-read. Pr B Denis and G Leroy will both be present. The 2 are the ones who discussed the crossing of the dog in Finland with an Epagneul Pont Audemer,without ever even bothering to consult the French Barbet club. I would take that as an insult....doesn't seem to bother our club. Hum. Or is that a sign that they already know that they didn't need to bother asking? And I am repeating myself, but the Club was not "aware" that a crossbreeding was taking place. You, who are member of the club, will be getting a bulletin where it is supposed to be mentionned...It was discussed ( probably in the a.o.b = any other business)at the meeting after the birth of the 4 pups. Way to go, club. Way to go. And yes, I certainly will ask them about it since Pr Denis DID tell me about it back in February and I thought, "hey, why should I tattle to the club...they already have 2 stoolpigeons(indics in French) did such a good job in 2009. Club president did say last week that I basically was supposed to have told her..haha! What on earth for? Like they care? No, they 3* being too busy trying to control the club to make sure nothing happens. *Meaning elected in the committee, if not elected they one has nothing to say!The Barbet doesn't have a chance to survive, that way.and they know it. I have already expressed my feelings about insemination on a "virgin" dog. I will not go back on it, and nothing or no one will change my mind.I think it is a question of ethics.If there are rules, then they are made by someone for a reason and not to be taken lightly by just a brush off of the hand of any breeder who may not respect it and claims to know better or know it "all". I also agree that the environment probably has something to do with it. Studies have shown( in other breeds) that coat textures evolve according to climate and that X animal living in Arizona and the same bloodline in the north of Sweden(for example) over the years, the coat will change. Why couldn't the "rest" with shorter days? I would add that what is interesting is the relationship and how lines work.If this is applicable here, then it is elsewhere for colors and the rest.